Focus of this chapter is the chemistry of Strigolactones. The structural features that identify the canonical versus non canonical Strigolactones, as well as the stereochemistry of the Strigol type and Orobanchol type families will be described. A special emphasis will be devoted to the total synthesis of natural Strigolactones as the most reliable and recommended method for successful structure elucidation of these natural products. However, due the complexity of the target molecules and to the high stereochemical control required to retain bioactivity, the synthesis of natural Strigolactones is currently not feasible on a multigram scale for applications in agriculture. 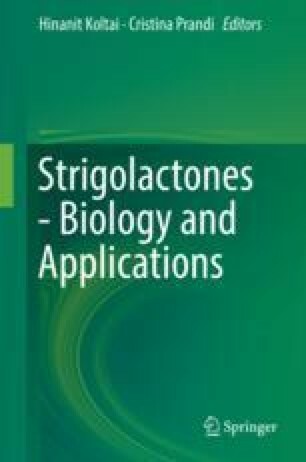 In order to study the effect of Strigolactones on various biological processes, model compounds were designed and prepared. Synthetic Strigolactones can be classified into two main categories: (a) analogues, whose structure is very similar to natural SLs; (b) mimics, whose structure is much simpler, but showing a bioactivity resembling that of SLs. A survey of the most promising structures for agricultural applications and the synthetic pathways to access them is herein provided. A term applied to the selective synthesis of one diastereomeric form of a compound resulting from the influence of an existing chiral centre adjacent to the developing asymmetric carbon atom. Is a stereogenic group or unit that is temporarily incorporated into an organic compound in order to control the stereochemical outcome of the synthesis. The chirality present in the auxiliary can bias the stereoselectivity of one or more subsequent reactions. A term which may be applied to any asymmetric object or molecule. The property of nonidentity of an object with its mirror image. A series of related techniques for the separation of a mixture of compounds by their distribution between two phases. In gas-liquid chromatography, the distribution is between a gaseous and a liquid phase. In column chromatography, the distribution is between a liquid and a solid phase. The property (as of an optically active medium) of unequal absorption of right and left plane-polarized light so that the emergent light is elliptically polarized. The order and relative spatial arrangement of the atoms in a molecule. Absolute configuration is when the relative three-dimensional arrangements in space of atoms in a chiral molecule have been correlated with an absolute standard. A pair of isomers which are related as mirror images of one another. A chemical reaction (or reaction sequence) in which one or more new elements of chirality are formed in a substrate molecule and which produces the stereoisomeric (enantiomeric or diastereoisomeric) products in unequal amounts. Stereoisomeric structures which are not enantiomers (mirror images) of one another. Often applied to systems which differ only in the configuration at one carbon atom, e.g. meso- and d- or l-tartaric acids are diastereoisomeric. The phenomenon in which plane-polarized light is turned in a clockwise direction. Compounds having the same atomic composition (constitution) but differing in their chemical structure. They include structural isomers (chain or positional), tautomeric isomers, and stereoisomers—including geometrical isomers, optical isomers, and conformational isomers. A form of spectrometry in which, generally, high-energy electrons are bombarded onto a sample and this generates charged fragments of the parent substance; these ions are then focused by electrostatic and magnetic fields to give a spectrum of the charged fragments. A form of spectroscopy which depends on the absorption and emission of energy arising from changes in the spin states of the nucleus of an atom. For aggregates of atoms, as in molecules, minor variations in these energy changes are caused by the local chemical environment. The energy changes used are in the radiofrequency range of the electromagnetic spectrum and depend upon the magnitude of an applied magnetic field. An equimolar mixture of the two enantiomeric isomers of a compound. As a consequence of the equal numbers of levo- and dextrorotatory molecules present in a racemate, there is no net rotation of plane-polarized light. The separation of a racemate into its two enantiomers by means of some chiral agency. The representation of a compound by two or more canonical structures in which the valence electrons are rearranged to give structures of similar probability. The actual structure is considered to be a hybrid or the resonance forms. A formal non-ambiguous, nomenclature system for the assignment of absolute configuration of structure to chiral atoms, using the Cahn, Ingold, and Prelog priority rules. The study of the spatial arrangements of atoms in molecules and complexes. Another name for configurational isomer. Reactions in which the stereochemistry of reagents affects the stereochemistry of products. Different stereoisomers as reagents give different stereoisomer as products.